GENEVA (AP) — FIFA presidential candidate Prince Ali has questioned the role of election rival Sheikh Salman in not protecting Bahrain players who alleged abuses after pro-democracy protests in 2011. In the strongest statement yet on human rights ahead of the Feb. 26 election to succeed Sepp Blatter, the Jordanian prince dismissed the sheikh's consistent defense that national security issues are beyond the control of sports leaders. "How are you then going to earn the respect of the entire world and players across the world, as well as FAs (football associations), if you couldn't even take care of your own?" Prince Ali told reporters on Thursday after a news conference near the United Nations office in Geneva. Sheikh Salman has become front-runner in a FIFA campaign he began by strongly denying any part in helping to identify athletes who took part in Arab Spring protests five years ago. Some Bahrain team players alleged they were tortured by government forces while detained for attending pro-democracy events. Sheikh Salman was then president of the Bahrain Football Association, and has often said government issues are not the duty of sports leaders. "Whatever is related to the political side and government side is not a concern of mine," the sheikh told the Associated Press in an interview in Paris on Tuesday. "We are people of football. They can ask me anything that is related to the game." Prince Ali rejected that argument Thursday, two weeks ahead of the five-man election. "If a candidate was in a position before and simply says that, 'Those issues are to do with politics and therefore I cannot interfere?' No," the prince told a small group of reporters. "If you are not going to take care of your own players and if you are not going to stick up for them, that in itself is a problem." In the earlier news conference, the prince replied to a question about human rights in Bahrain by saying the protection of players was a "simple, basic fact of the matter." 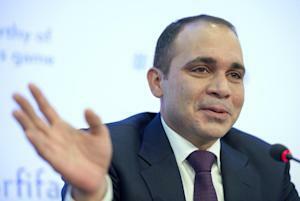 Still, Prince Ali acknowledged that a candidate's record on human rights was for the FIFA election committee to decide. The three-member FIFA election panel approved Sheikh Salman's candidacy in November after weighing an analysis by the governing body's ethics committee. "I give the benefit of the doubt to everyone," said Prince Ali, whose home nation Jordan also saw pro-democracy protests in 2011 on a lower level than Bahrain. After the news conference, he spoke privately with the U.N. High Commissioner for Human Rights, his cousin Prince Zeid Raad al-Hussein, who is based in Geneva. Prince Ali also presented a timeline for key decisions and policies in his first year in office. Early priorities would be reviewing the Garcia Report to publish its findings of alleged corruption in the 2018-2022 World Cup bidding contests and begin a process to recruit a new FIFA CEO. In April, a Prince Ali presidency would look at 2026 World Cup bidding and meeting sponsors and broadcast rights holders. Later Thursday, the prince was due in Miami with his opponents — Sheikh Salman, UEFA general secretary Gianni Infantino, former FIFA official Jerome Champagne and South African businessman Tokyo Sexwale — meeting 35 voting federations at a CONCACAF assembly. Unlike other FIFA continents, the North and Central American and Caribbean region will not try to endorse one man as a bloc. Prince Ali criticized continent-wide endorsements, as Africa's governing body did urging its 54 members behind Sheikh Salman last week, as wrong and trying to "create a myth" of voting intentions. "Nobody likes to be told what they have to do," said the former FIFA vice president. Sheikh Salman told the AP this week FIFA would be best served by uniting behind one candidate before election day. Asked if all five candidates should stay on the ballot paper, Prince Ali said: "If there is to be a democratic election, it should be based on that." With 207 of FIFA's 209 members currently eligible to vote, a total of 138 would secure victory in the first round. A simple majority is needed in subsequent rounds. Prince Ali ruled out making deals with rivals and suggested at least two opponents were still influenced by Blatter, whose appeal against an eight-year ban for financial conflicts of interest is heard at FIFA on Tuesday. "If you are going to behave in this way in order to win," the prince said, "then nothing will change when you are president if you are owing favors."